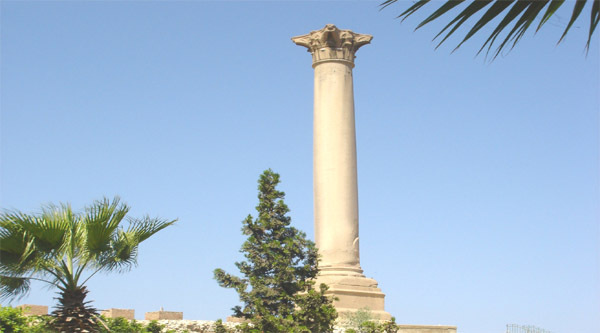 Pompey's pillar or a ship mast which was constructed in honor of Diocletian in 292 AD is situated in Alexandria in the area known as Kom el-Dekka and is dominating the area. On the base of the pillar we find an inscription “Postumas a governor of Alexandria erected this pillar in honor of a just emperor Diocletian”. Crusaders gave the name to this pillar “Pompey's” because they wrongly thought that the head of Pompey was buried on the top of it. But Pompay himself was killed at the year 48 BC and the column was erected later at the year 292 AD. 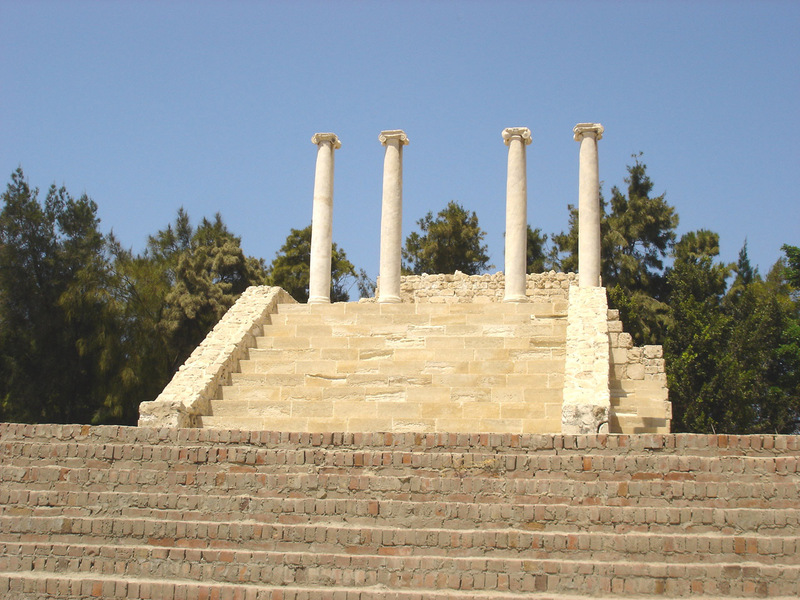 Originally this column was taken from a magnificent temple of Serapis. It's made of rose granite, has a Corinthian style capital and it was with its base 26,85 meters high , it's diameter at the bottom is 2,7 m and at the top - 2,3 m.
Scarab - made of rose granite, the 2nd hugest one in Egypt. It doesn't have any inscription but from the way of construction we can assume that it belongs to the New kingdom and exactly to the 18th dynasty. Three statues of sphinxes - the 1st and the 3rd one are made of rose granite, they belong to times of Ptolemaic the 4th or the 6th. In the middle there is one more sphinx made of black granite with the missing head. These sphinxes bear a hieroglyphic inscription with the name of Hormoheb – the last king of 18th dynasty. There human statues - the 1st one is made of rose granite and belongs to Ebsmatik - the founder of the 26th dynasty. It shows the king kneeling. The upper part of the statue is missed now. On the back and the base of this statue there is a hieroglyphic inscription with the name of Ebsmatik. The 2nd statue is also made of rose granite and represents Ramses the II. He sits on his throne holding haka – scepter in one hand and nekhekh - flail in another hand. His heads missed and on the base of the statue we find both names of Ramses - wser ma'at ra step en ra, ra mes su. The human statue is made of granite and also belongs to Ramsess the II, who holdes in his both hands nawous (shrine). The upper part of the statue missed as well. It's known, that Cleopatra the 7th brought these 3 statues from Heliopolis to decorate Serapis temple.